So I've worn this outfit (minus the red vest) probably 3 times the last month! I love the casual yet chic vibe it gives! 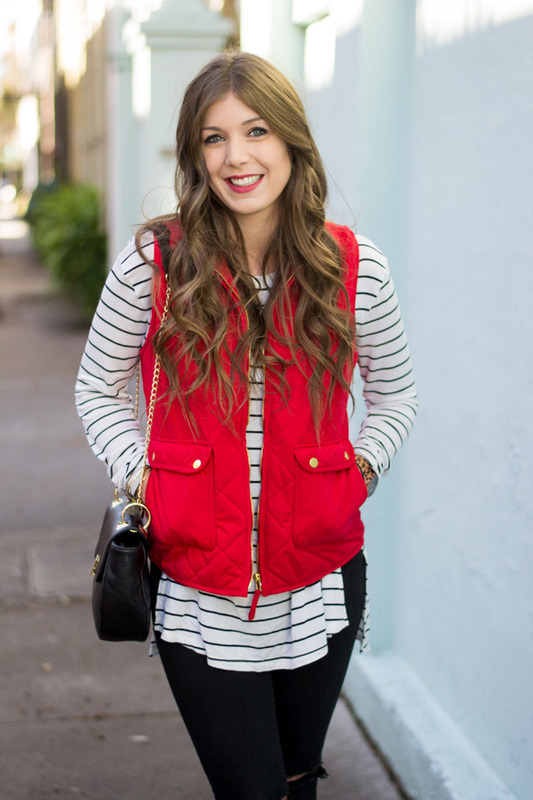 I decided that it was time to spice up my go-to outfit for once and throw on this vest, which I love! 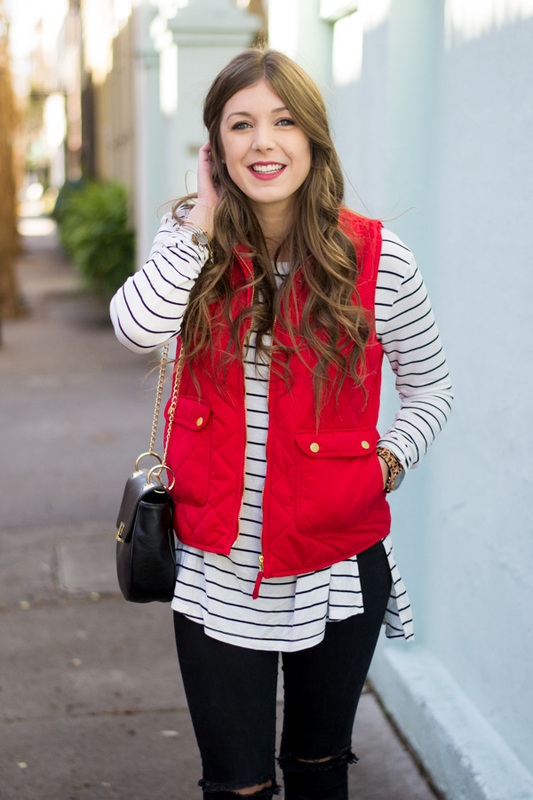 It's pretty obvious over the past month that I love adding a pop of red to my outfits, and this vest is no exception! Love your entire outfit. I love the pop of read on a cold winter day. Such a cute look! Head to toe flawless! I love a good vest! This one is so cute on you! I love the pop of color! And you hair looks amazing! I swear, I am a puffer vest addict! ha! I have almost every color but my red vest is one of my most worn! Love how you've worn it here with stripes. Such a cute look! 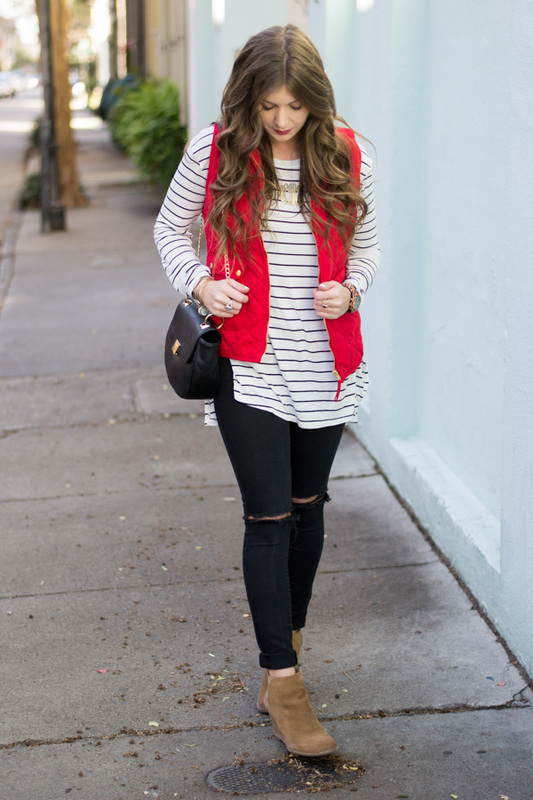 Such a cute vest and I love how you styled it! I'm not going to lie - I'm kind of obsessed with red right now. Such a power color! I love it with the stripes! This is an awesome look! I love the red paired with the striped top. Such a fun nautical look. You pull off red so well! It always messes with my skin color. Love this look so much, and your hair is simply gorgeous! Oh my gosh! I love RED on you, Kelsey. So pretty! Red really looks amazing on you! I love the pop of color. The black jeans and striped tee is my go-to outift also! I love this whole look, especially the pop of red! Such a pretty pop of red! And those stripes are awesome too! This look is amazing! I love that vest! You look so pretty in red!! Can't wait to see what you wear for Valentine's Day! this red looks great with your hair color! Perfect cute and casual outfit ... the pop of red is fantastic! 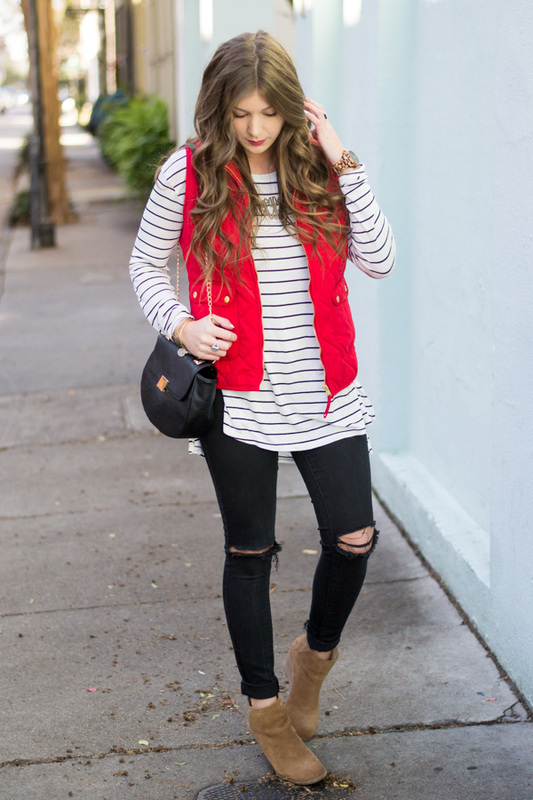 I'm obsessed with this vest! It's so cute and the red is such a great color on you! Love the stripes with the pop of red! Such a classic look, especially with that monogram! Love it! I love everything about this outfit! I've been wanting to get a puffer vest! Well my mom would love this! 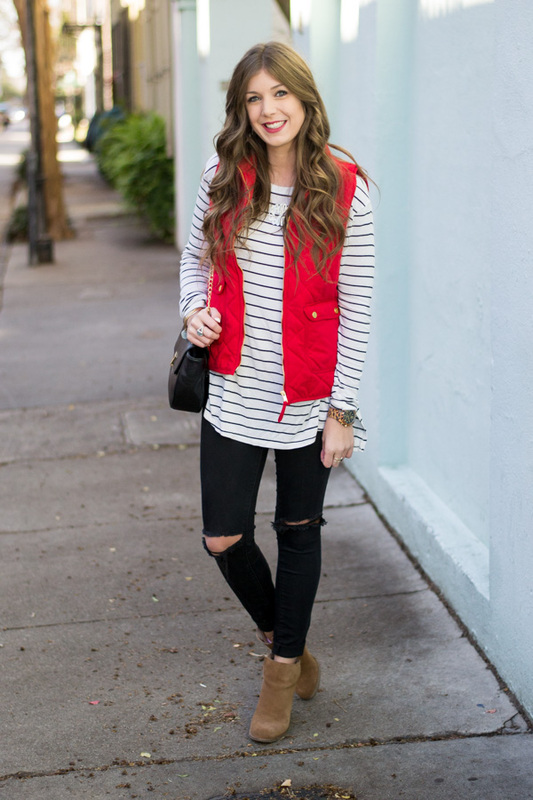 She is obsessed with everything RED and puffy vests! 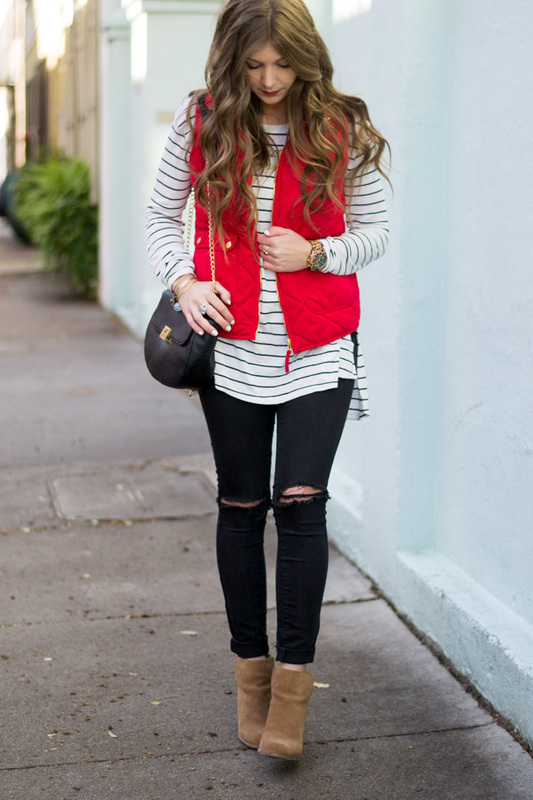 I love how you styled your red puffer vest! It's too cute! And your hair is a dream. Have you ever thought about doing a tutorial? LOVE that pop of color! Such a pretty color on you! Such a cute classic look and I love that red on you! That vest is amazing! I love the shade of red! I love this! I'm always on repeat with my go-to outfits! Love the way you switched it up! This outfit combination is perfect! You have great style! I also love the way you styled your hair. This looks so great on you! 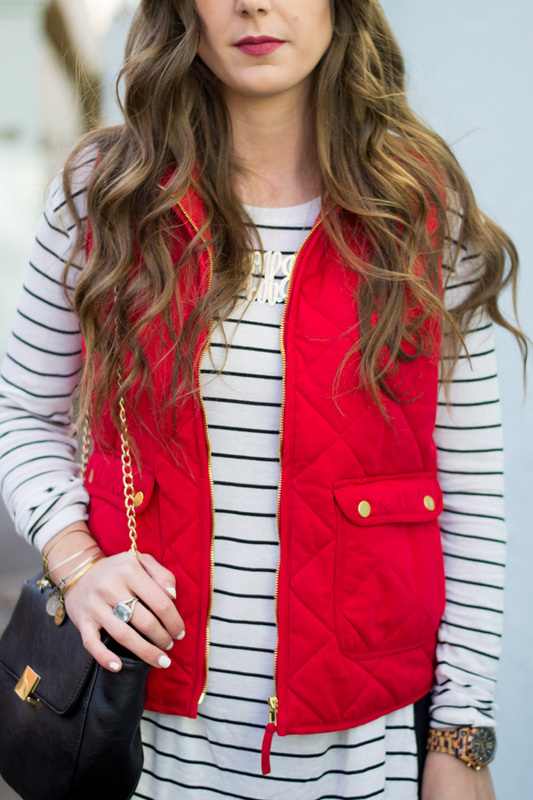 Love the stripes with the red vest! I love that pop of red with the black and white stripes. Gorgeous. 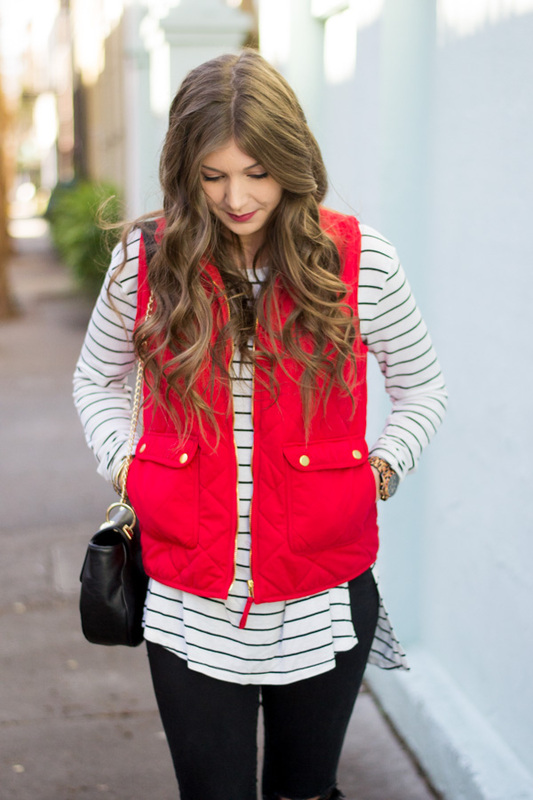 Love the bright red color of this vest! Super cute casual outfit!! I couldn't agree more, this is such a great go-to outfit! Perfect, literally for any event or activity. I love the pop of red with it...makes it such a standout outfit!! Gorgeous as always!! 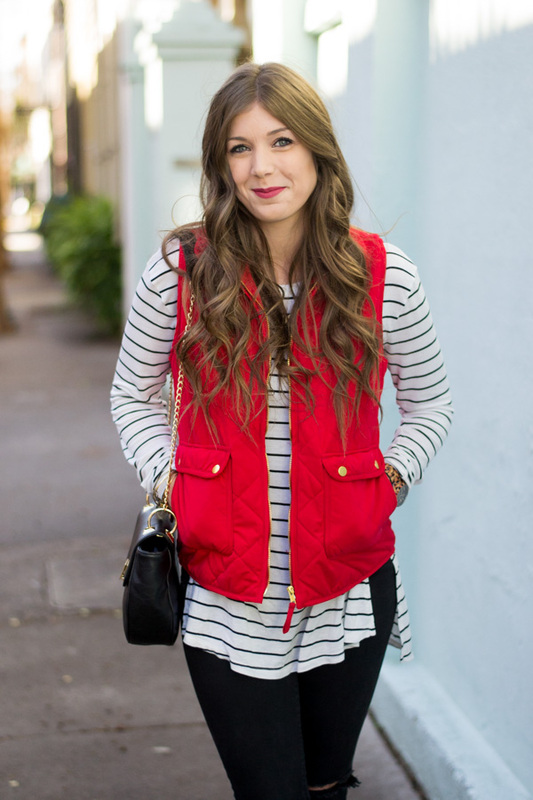 I love the color this red vest adds to this outfit! Can't ever go wrong with stripes in my book. I love wearing vests, but I don't have a red one (yet)! Love this look. I absolutely love that outfit! The red really brings it all together! Love this look! Red is an awesome color on you. I don't think red is good on me. Also, hair envy! This puffer is ADORABLE! Love it!